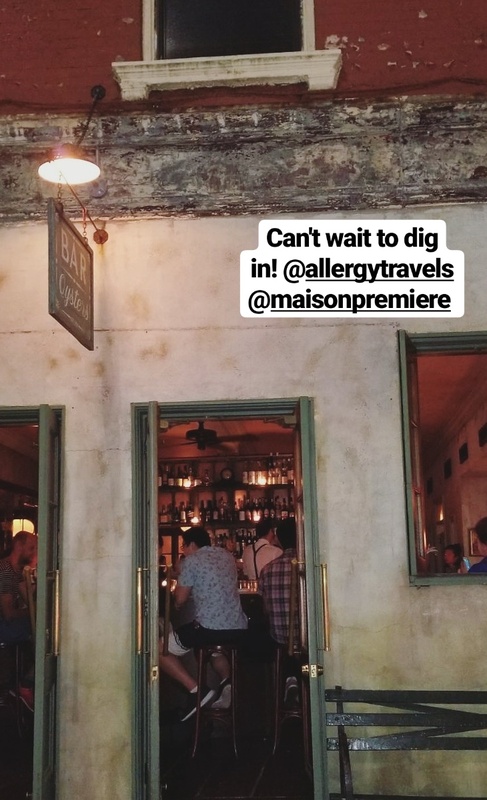 Did you catch our takeover of the Allergy Travels Instagram stories last week? I was in NYC for a few days for work and took Brandon with me. I can never resist adding a weekend when I visit New York! This time was a little different than past trips because I didn't visit my usual spots for brunch and dinner. But we did manage to find some great new places that are worth going back to. 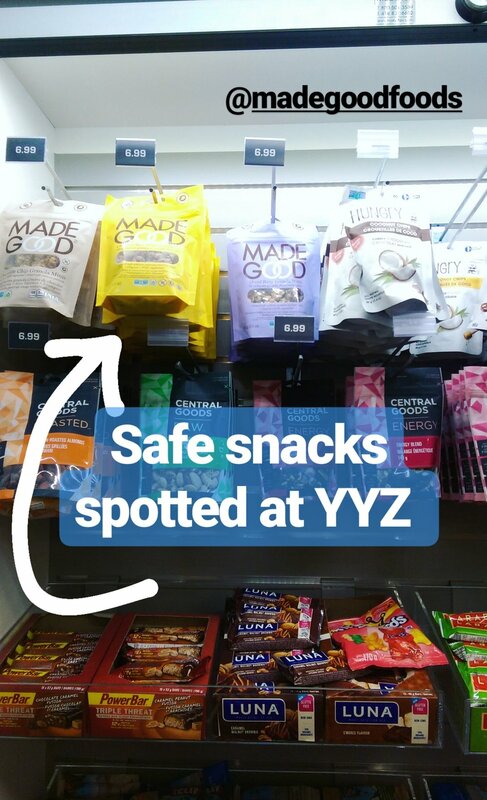 The first thing we did upon arrival in the city was to hit up the closest Whole Foods and grab some room snacks for the week. We stayed at The Tuscany in midtown which was a poor decision traffic-wise since the UN conference was happening down the street. Other than that it was a nice hotel and our room was upgraded to a super spacious pad so we were happy. There was a walk-in closet, makeup counter, and king size bed. What more could we ask for? And did I mention that the Whole Foods was less than a ten minute walk away? On Saturday we slept in, had coffee (I always travel with a pack of Starbucks Via's) and fruit in our room, and then set out to pick up some tasty food for a picnic in Central Park. This is one of my favorite things to do on vacation because it's a relaxing and enjoyable way to spend the day, and also cuts out one or two restaurant visits. We visited Whole Foods again as well as Eataly, where I learned that the prosciutto I have eaten many times is actually sliced in the same area as the cheese. Like surrounded by huge wheels of parmesan and handled by the same hands. 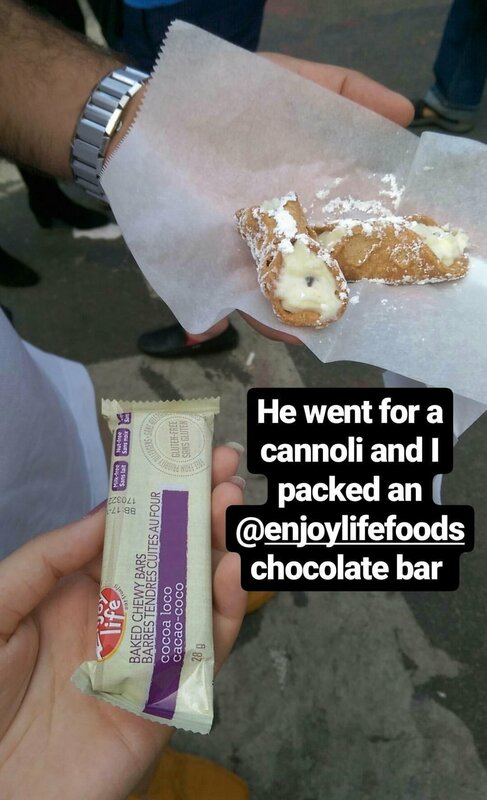 I was totally shocked, but if you've been to Eataly you'll know that it's pretty much constant chaos so things that like are easy to miss. Last time I was there I recall thinking it was odd that some packs of pre-sliced prosciutto had allergy warnings and some did not. Needless to say I didn't have any this time and won't in the future. We had a spectacular dinner at Maison Premiere in Brooklyn, which has possibly the best raw bar I've sampled in the city. From outside it looks quiet but as soon as you enter in it feels like you've stepped into the past. The wait staff is very knowledgeable about the food and cocktails and our waitress told me they even washed our water glasses about forty times after I gave her my allergy card. We split a chilled lobster to start and the food runner who dropped it at our table he told me that the kitchen staff was well aware of my allergies and that it was safe for me. Bonus points straight from the get go! We then split a platter of clams, oysters, and shrimp that were briny and delicious. The best part of the evening though was getting a table in their backyard garden. It's so romantic with tons of flourishing plants all around and overhead, firefly lights, and whimsical furniture. Most people with food allergies don't wake up and think let's go to all the food festivals I can't eat at today. But I do, because they're about so much more than just food. There's the vibe, the atmosphere, the people, and the energy. I also enjoy when Brandon gets to enjoy street food. And in an environment where everyone is constantly walking it's easy for me to pull out my snack and enjoy a safe treat myself. First we went to the Feast of San Gennaro in Little Italy which was absolutely packed with people. There were a couple vendors who advertised they only used 100% peanut oil and admittedly I held my breath as we walked past! The selection was Italian American food and mainly all things deep fried, stuffed with cheese, made from pastry, or served on a bun. So not very Mandy-friendly. But I had my Enjoy Life bar in my pocket for a safe treat. Brandon decided we should have carnival day at home and make safe versions of all the foods I wasn't able to eat. When we do that (very soon) I'll be sure to post some recipes! We then wandered over to the Nordic food festival that was hosted by Vice. Completely different vibe and food selection from the Feast which was mainly families. In contrast this was 21+ and there were plenty of young instagrammers taking snaps of the event. 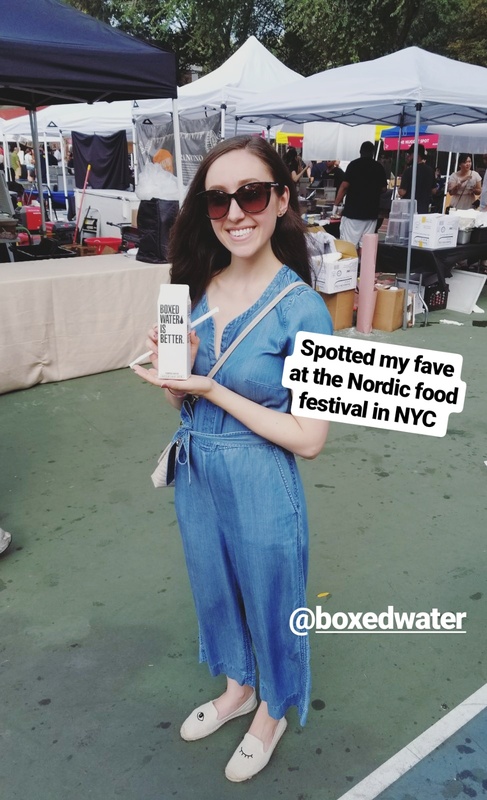 It might sound weird to get excited about water but I was really excited to find Boxed Water there because it was something I could actually have! And as a water snob it's one of my favorites. I've eaten at Bistango once before, when a vendor took me there for dinner on a buying trip for work. They handled my allergies well then, and did so on this trip too. They have two locations, one in lower midtown and one at 50th street, which is where we dined this time. This location is a bit fancier and a lot bigger. It also has a patio but it was way too humid to sit outside. The server spoke to the chef about my allergies and showed them my allergy card, then checked what I preferred to eat. I asked for a piece of fish with a salad and it was really flavorful and tender. I love when fish has a crunchy seared crust. <-- I also got engaged to this guy! So it was a special meal for us. Brandon enjoyed his dinner as well, leaving not a single bite on his plate. We're both eager to go back on our next visit. We did have one not so great restaurant experience on this trip that I will share with you. On Saturday night we were out scouting a good bar and were referred to one on the lower east side that looked really cute. None of the beers on the menu were familiar to me and I don't like to just randomly pick one without knowing what it is (yes it's rare but beer can contain peanuts, dairy, or other allergens) so I ordered 6 oysters for Brandon and I to share. I told the waitress about my allergies as I had forgotten my allergy cards at the hotel. She was hesitant to write them down and just waved her hand and said no peanuts. But looking at the one person in the kitchen and the number of nut-containing items on the menu I wasn't convinced that was a good enough answer. I insisted she talk to the chef before placing the order and she said she would. The back wall of the bar was a large mirror, so I was able to see her walk past the kitchen, go punch the order in, not talk to anyone, and then sit down and eat her dinner in the back corner. After waiting a few minutes she still hadn't spoken to the chef so I walked over and asked her to cancel the order. We left there pretty quick. In most situations something like a plain oyster seems pretty safe, but in a small kitchen where the same person is preparing all the dishes there is still potential for cross-contact and it's really not worth the risk. It can be uncomfortable but always trust your gut and don't be afraid to speak up. 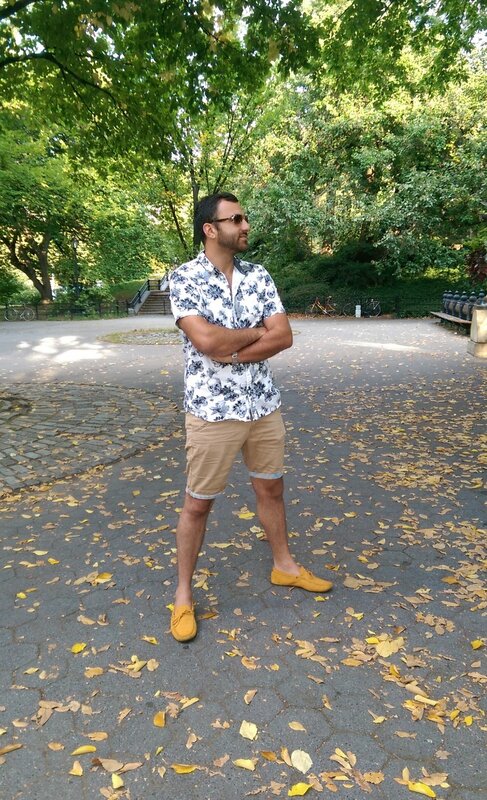 Do you have any recommendations for where to eat in NYC? Share it with us in the comments below!